The Alaska Airlines Foundation is awarding $100,000 in grants to nonprofit organizations in Hawaii, as part of a special donation to celebrate Alaska Airlines' 10th anniversary of service to the Islands. Funds will support 10 programs working to better the lives of youth in the local community and provide education and workforce development programs across the state. The Alaska Airlines Foundation presented $10,000 grants to 10 nonprofit organizations in honor of the airline's 10th anniversary of service to the Hawaiian Islands. 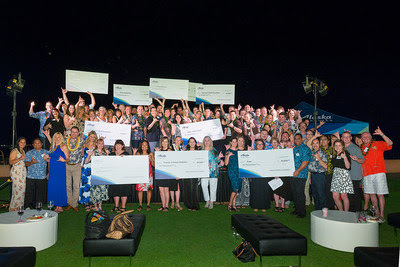 Organizations were honored by Alaska Airlines employees at a community reception at the Royal Hawaiian in Waikiki on Nov. 6. Alaska Airlines Photo by Bradley Goda. "Hawaii has a special relationship with Alaska Airlines. 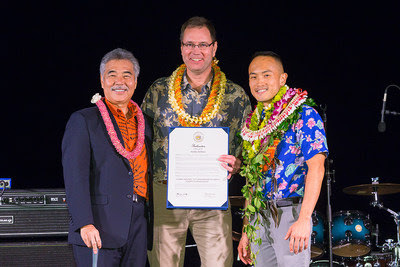 During the Great Recession, the airline provided a U.S. West Coast connection and a much-needed boost to our economy," said Hawaii Governor David Ige. "Ten years later, it's the number one carrier from that market, and its passengers contribute over $2 billion to the state's economy each year. But the bond goes beyond the economic impact. Alaska Airlines is part of our ohana and our shared values. We look forward to a long and productive future together." Over the past decade, Alaska Airlines has provided nearly $2.7 million in cash and in-kind support to more than 180 Hawaii organizations. Alaska Airlines flies the most nonstop flights from Hawaii to the most destinations on the West Coast, with 179 flights per week from four Hawaiian Islands. "Alaska Airlines is all about people," said Alaska Airlines CEO Brad Tilden. "We are grateful to be a part of the incredibly generous community spirit in Hawaii and love connecting people to this beautiful place." AccesSurf empowers people with physical and cognitive disabilities through accessible water programs. Aloha United Way creates a healthier community by supporting programs and services that give children opportunities to achieve their full potential. Big Brothers Big Sisters Hawaii creates life-changing friendships by matching kids or "littles" with mentors or "bigs" and guides kids, mentors, and parents on this life-changing journey. Boys and Girls Club of Hawaii inspires young people toward a greater future by providing a safe place for kids, which includes professional mentorship, character development and life-enhancing skills. Friends of Hawaii Robotics supports Hawaii's nine robotics programs in elementary, middle and high schools statewide and creates opportunities for students to develop essential twenty-first century life skills, which prepare them to become Hawaii's leaders of tomorrow. Hawaii Youth Symphony advances critical and positive links between music study, academic achievement, and social emotional development. Islander Scholars honors public high school juniors who exemplify the values that make Hawaii unique, forming a cohort of young leaders who will help Hawaii thrive in the future. Kapiolani Health Foundation supports Hawaii's only maternity, newborn and pediatric specialty medical center, providing exceptional medical care to women, children and families. Kupu provides hands-on training programs that educate and mentor youth to become stewards of Hawaii's culture and environment, helping them develop a strong connection to the place in which they live. Make-A-Wish Hawaii grants memorable wishes for Hawaii's critically-ill children, helping them to imagine a future without illness and believe in what's possible. Learn more about these organizations on the Alaska Airlines blog. "We have the privilege of flying to one of the most beautiful and amazing places on the planet, and we are dedicated to doing our part to keep it that way for many generations to come," said Daniel Chun, Alaska Airlines director of sales, community and public relations for Hawaii. "We're proud to partner with these outstanding organizations in helping to build a bright future for Hawaii." The Alaska Airlines Foundation was established in 1998 as an independent 501c (3) organization as a way to supplement Alaska Airlines' overall corporate giving program which last year donated $13.5 million in cash and in-kind support to charities throughout the airline's system. Each year, the Alaska Airlines Foundation distributes cash grants to nonprofit organizations in Alaska, Hawaii and Washington that support youth and education and workforce development efforts. Applications are reviewed twice per year. Eligible nonprofits are encouraged to submit an online application at donationsalaskaair.com by April 15 for mid-year consideration and September 15 for end-of-year consideration.